to adopt by-laws by which said Association may be governed. We know of three burial plots purchased by the FLPBA: two in Montefiore Cemetery in Springfield Gardens, Queens, NY and one in Beth Moses Cemetery in Pinelawn, NY. Gates of all three plots are shown, below. To see names of those interred in all three plots click the link "names," below the gate photographs. In September 2008, gravestones in the plots at Montefiore Cemetery were first recorded with a digital camera. We revisited the plots in 2012, recording previously missed and newly installed stones. In addition, we visited and recorded the Beth Moses plot in 2012. Hebrew names and dates have been translated and added to the Jewishgen Online Worldwide Burial Registry. There are 283 burials recorded, in all. 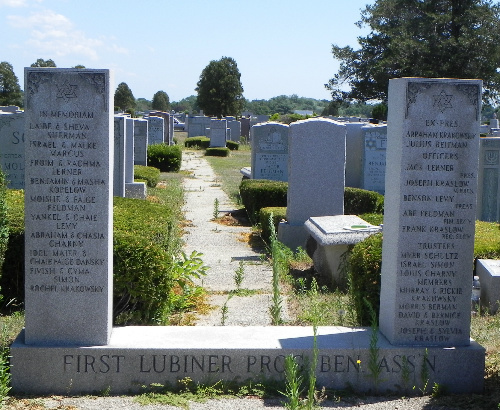 You may search the full FLPBA database (with headstone photographs and Hebrew name transcriptions) on the Jewishgen Online Worldwide Burial Registry. Enter a town search (is exactly) for Yurovshchina and Geographical Area USA, New York to see all the burials. Or, search for individuals by entering their names. List of names included in the three burial plots in New York. The Museum of Family History website provides the names from the two FLPBA gates pictured above at Montefiore and the one at Beth Moses. These gates present the names of FLPBA officers at the time of placement, gate committee members and additional FLPBA names.